Last weekend I took a little timeout from the pile of crap that 2014 has presented me with so far and drove to Frankfurt to meet a friend of mine and spend the weekend doing what we do. 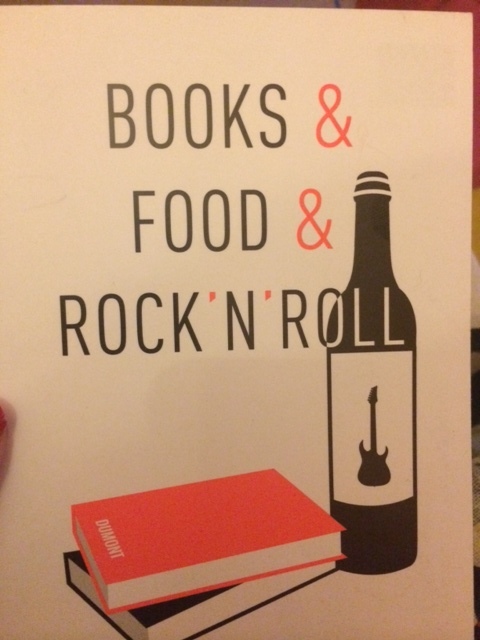 Which is so to say shop, listen to music, eat, visit the book fair and get tattooed. I left work early on Friday and had to take an unplanned quick stop at home because – what a coincidence! – my mom had been admitted to hospital again on Thursday. This time it’s another hospital and it’s more of a ‘better safe than sorry’ thing and she’s feeling fine. But it was still bad timing because she was meant to take care of my cats. I had to get home and clean my place a little bit before I left, so my neighbor, who had kindly agreed to be the cat sitter, wouldn’t die of a shock. The drive to Frankfurt went surprisingly well. I gotta say I love taking roadtrips by myself. I also like taking them with (the right) people but driving by myself has its own perks. No quarreling over who gets to choose the next song. No multiple stops at every other rest stop because someone always has to pee, needs a snack and plainly wants to stretch their legs. And you get lots of thinking and planning to do in your mind. One of these days I’m probably trying to set up Siri so I can make notes while driving. I had so many good ideas for this project I’m working on but it’s hard to remember them all. I also got a lot of really, really bad singing done. I never sing along to music with people around – don’t ask me why! – but when I’m alone in the car, I give it my all, no kidding. Anyway, surprisingly, I only got stuck in traffic once, for about thirty minutes, the rest went so smoothly, I arrived early enough to freshen up at the hotel. The hotel wasn’t anything special, but nice and clean and I loved the design of everything. A lot of blue and beige and a modern design. The only thing that left us puzzled was the sink that was right in the room instead of in the bathroom. Admittedly, there was already little space in there anyway but still! The first thing we did on Friday night was head to a tattoo appointment we’d scheduled to get our shared tattoo. 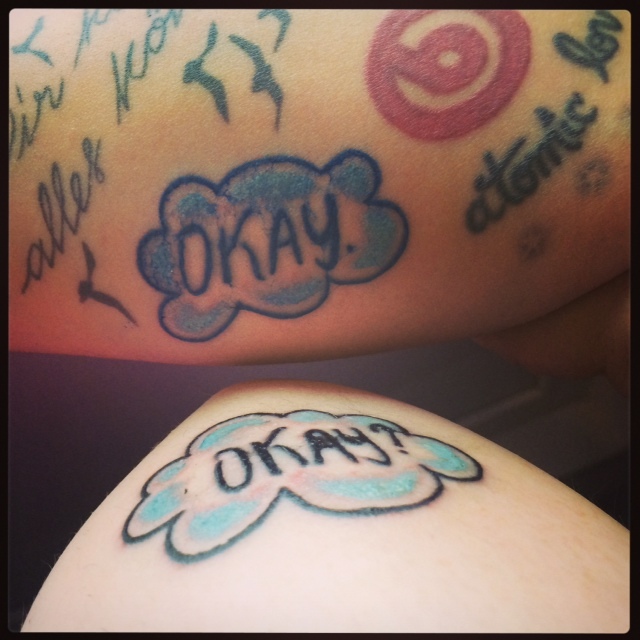 It’s half friendship tattoo, half John Green appreciation and I love it. “Okay?” – “Okay.” is something that Hazel Grace and Augustus say on the phone continuously. It’s their thing, a way to reassure and comfort each other. It’s one of the things that screamed ‘friendship’ to me about this book, so it was only right that my oldest friend and I got those, especially since we’re both so in love with John Green’s writing. I got it on my lower arm, just below the elbow. In the picture, mine’s below, the one with the question mark. So far it’s the most painful tattoo I got, even my foot and the spine area were easier to handle. Maybe I’m getting more sensitive with age, I don’t know. I also bled a lot more than my friend. Body, WTF u doin’? Anyway, we got it done at a very cute studio by a very nice and lovely little lady. She had pictures of her work all over the place, as tattoo artists do, and she does a lot of Tim Burton stuff, too. I wanted her to ink me all over! After we got our ink done, it was time for food. I know it isn’t smart but I never like to eat before a tattoo appointment. I mean, I drink sugary stuff, so low blood sugar won’t be an issue but I don’t like a full stomach while I’m supposed to sit still. So I was ravenous. We ended up at the cutest burger joint I’ve ever seen. It’s called Bully’s Burgers or something like that and their mascot is a little French bulldog. They have pictures of it in different poses and memes all over the place. So adorable! It’s also tiny and we were lucky to get the last table. They pretty much offer only burgers in different variations. I had a Spanish burger with chorizo and ordered sweet potato fries and guacamole dip on the side. The burger was alright, though I wasn’t crazy about the chorizo but the fries were amazing. I kept eating even when I was full. The next day was dedicated to shopping, shopping and shopping with a side of excessive eating. We drove into town where we’d been told we’d find a place that sells Urban Decay (which, shockingly, we weren’t able to buy in Germany yet). When we got there, though, we were told that we were one week too early. Noooo! So, we had to compensate this shock by spending our cash elsewhere. We raided Primark and then moved on to H&M. It sounds stupid because you can find H&M anywhere but the one in Frankfurt is the only one that also has a Home department. I spent way too much money there but who can pass up a shower curtain with little skulls on them? Or a pillow case with a circus monkey on it? Right? Otherwise, the city center didn’t really have a lot to offer, so we moved on to the Skyline Plaza, a mall that apparently had a great view of the skyline. 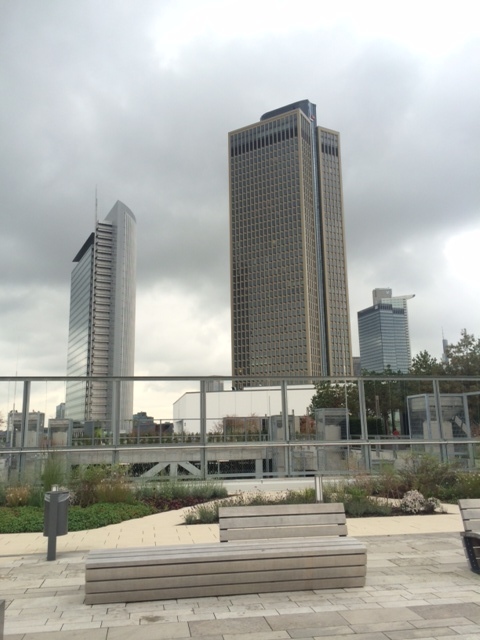 This proved to be only half true because it was way too central to over a full view but the roof garden was still great. They had little patches of green up there and also a restaurant with a terrace. Overall, I can’t say that I was disappointed with it. The weather sucked a bit but the sky scrapers still looked pretty cool against the background of the huge clouds. The mall itself was less spectacular. You got the usual chain stores, some fast food places, nothing surprising. Except that Zara also had a Home store there. I bought two glasses with skulls on them but otherwise found the stuff there too expensive for what it had to offer. Most of the things I bought in that mall, I could have found here as well. Shopping was still fun because I got to do it with a good friend and because it’s always more fun when you do it on a day off and with nothing else on your schedule but I had hoped to find more interesting shops in a big city like that. Originally, we had planned to go see a movie but then the waiter in the rooftop restaurant messed up our order, so dinner took ages and we couldn’t really agree on anything we wanted to see or hadn’t seen yet, so we went back to the hotel after dinner. My friend showed me the road movie she and her friend took of their last vacation and we just caught up with each other’s lives over a good old round of crappy television. Not exactly a ‘party hard’ kind of night but we had a long day ahead of us on Sunday, so getting some sleep wasn’t such a bad idea. The next day, we went to the book fair. What a disappointment! I’d been there two years ago and it was pretty cool. This year, we bored ourselves through the fair with nothing to do and nothing to see. None of our favorite authors were there and even though we’d planned to just let it surprise us, we ended up never even finding our way to anything that was going on. The map of the place wasn’t clear on anything and it was so crowded that we were just pushed around all the time. Last time I went, it was a Saturday and less crowded, probably because you can only buy books on the Sunday. This time around, it was like the whole country had decided to come to the fair. And they all brought their tiny kids or came in elaborate cosplay costumes that were great to look at but let’s face it, a huge ball gown or some kind of warrior costume with huge spikes all over the place aren’t really ideal to move smoothly through the masses. Not to mention that every few steps, someone showed up in a really cool costumes and people would stop in the middle of everywhere to take a picture. It’s shocking, I know, but I ended up not buying a single book. I simply couldn’t concentrate for long enough to really read a single sentence, let alone decide if it sounded interesting enough for me to buy the book. So I just took a lot of notes about books I may want to read eventually. The only thing I took away from the fair was a postcard that I felt summed up the weekend quite nicely. When we left the fair – and paid half a lung for parking – it was time for my friend to get to the train station. We arrived with enough time to have a quick snack together. Again, the waiter forgot my order – boo! – but eventually, it arrived anyway. I had lovely apple strudel with cream. Gotta treat yourself, right? I really haven’t made smart food choices this weekend but considering that I didn’t eat much but walked a lot, it was still okay. And the strudel was so worth it. So, so worth it. I mean, come on, it had marzipan in it. Marzipan! Plus, I went to get a Pumpkin Spice Latte from Starbucks for the way home and they didn’t have any. It was the first Starbucks I’ve seen that had pumpkins all over the place and pretty much forced you to order a damn PSL…and they didn’t have any left. What the…?! I’d say food-wise, I wasn’t really lucky in Frankfurt. Overall, it was a good weekend. Not ideal and some things went wrong or were a little disappointing. But I got to see my friend again, we got to catch up, there was new ink involved, we did some satisfying shopping…and the food was great, once it actually got to me. And since I didn’t get to go to Vienna, at least I got to see Frankfurt this year. That’s a little something at least. The real tragedy of my life is that I absolutely love mornings but I absolutely hate getting up in the morning. Once I’m up and awake, it’s great. I love being outside in the morning, smelling the fresh air, feeling the slight chill, hearing the world come to life. I like to think that every morning holds a whole lot of promises for the rest of the day. There are so many surprises in store for you. The weather and the temperatures are still undecided, only giving you a subtle hint of what it’s gonna be like for the rest of the day. There are only few people out and about, so the noises of the city aren’t really filling the air yet. Instead, you can hear birds singing, insects buzz, leaves rustle in the breeze. People who are already awake and starting their day are either the positive morning people kind or they’re still too sleepy to be moody, so everyone’s really friendly and polite and everyone just agrees that they’re still excited for this new day and the opportunities it will present for them. Hardly anyone has experienced anything bad so early in the morning, so people just didn’t get a chance to get grumpy, yet. The sad part is I rarely get to experience that. My mind can process all this and decide that it would be good for me to get up early, go out and do things to start the day on a good note. My body, however, cannot. If it’s a day like today when I have to be up and at work early, I don’t really get a choice. But my body still rebels against it. I’m tired and not really alert. My stomach feels queasy and stuck between hunger and nausea. My head aches and throbs and begs to be sent back to bed. I’ve tried to change my routine and sleeping pattern but no matter what I do, mornings just aren’t my time of day, it seems. It doesn’t matter if I get up early for a longer period of time or change my sleeping pattern every day. On top of this, my shifts at work keep changing almost weekly, so keeping up a steady routine is hard, if not impossible. I could still get up early before a late shaft but that would mean going straight to bed when I get home. Which I’ve tried but my body cannot unwind this quickly. It needs an hour or two of television, talking to friends, randomly surfing the web and maybe a snack before it can relax enough to sleep. Not to mention that depending on my shifts, my activity level changes throughout the days. On gym / exercise days, I sometimes go before work, sometimes after work. Sometimes it’s early afternoon when I get to exercise, sometimes it’s after nightfall. I don’t know if it would be easier / possible for me to become a morning person if I had a steadier routine. I heard that it’s something you’re born with and that it’s very hard to change, although I wonder how people adjust to new time zones then, unless it’s a daylight or hours between waking and becoming energized thing. But I guess unless there’s a change of jobs somewhere in my near or not-so-near future, I won’t find out. On a bit of a worried note, I have a bad feeling about this week’s weigh-in. I still feel heavy and have started to believe that it may be related to whatever is wrong with my stomach. I guess I’ll find out what that is all about on Friday. I don’t want to leave this entry on a bad note, though, so I’ll add that my friend and I have made plans for getting tattooed together in October. It’ll be a tiny thing and I won’t share what it is yet but OMG, I’m excited!